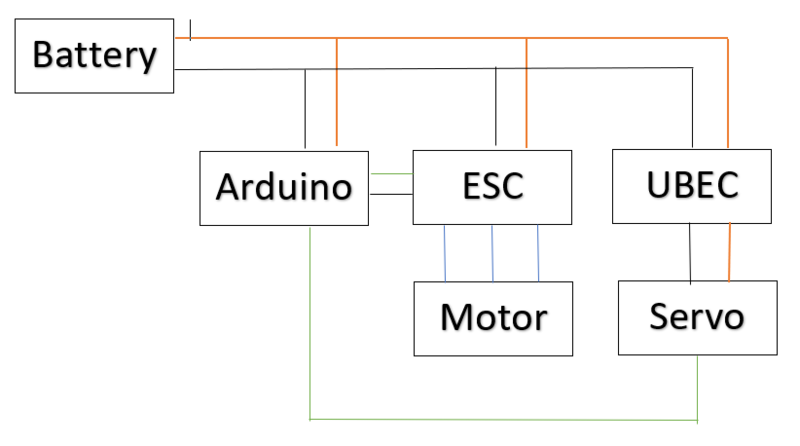 I am designing a motor controller with an Arudino, UBEC, and ESC. The Arduino will control Servo Motors and Brushless Motors. I want to make sure I understand how to hook up all the devices to avoid issues. I have been researching ground loops and want to make sure that I won't have any electrical issues. I have attached a schematic of what I believe is the correct hookup guide. The black wires are ground, orange is power, and green is the signal wire. Browse other questions tagged power motor groundloops or ask your own question. L293D Brake Doesn't Work (LB1836M good alternative)? Can I test a USB port with a multimeter? what type of modification can i use in my MCU in conjunction with my SSC32? Will this servo stall detection circuit damage an Arduino?